The Denver Petroleum Club was established in 1948 to facilitate the economic growth of the oil and gas, and other energy industries through business, social, and networking events. Spanning more than six decades and boasting a membership of 2400 in the 70’s and early 80’s, the DPC was THE place to make contacts, or meet with friends and clients. Today, the Club remains committed to bringing together energy professionals in the Rocky Mountain west to socialize and network, as well as discuss issues, learn about various energy-related topics, and engage in meaningful dialogue with their peers. 1948: Touting a full lunch and dinner menu, and a slot machine that favored the house, the Club officially opened in the Ranch Room of the Albany with a $25 initiation fee and a $5 monthly membership fee. 1954: By now a successful enterprise, the Club quickly outgrew the Ranch Room and moved to the Edelweiss Cafe on Glenarm for a brief period. As it expanded, the Club struck a deal to lease the top three floors of the new Columbia Savings Building a.k.a the “Old Petroleum Club” under construction at 16th and Broadway. In the interim, the Club operated at the Mile High Center in 1955-1956. 1956: The Ladies of the Petroleum Club formed. While not involved in the Club’s operations, members recognized the importance of the women’s social skills. Denver was the only club to have an associated women’s organization. 1957—This was a splendid year for the Club as it moved to its new digs at Columbia Savings. 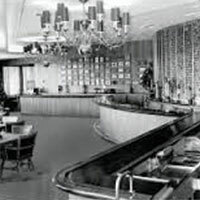 With its own kitchens, card room, meeting rooms, several plush dining rooms, lounges and offices planned by a prestigious Los Angeles design firm, the Club was in its heyday. 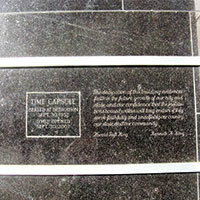 2005: A 50 year time capsule located in the old Columbia Savings building was opened. It contained a sample of uranium, gold, and oil as well as the membership directories for the Petroleum Club, the Baptist Church and an oil and gas publication from a company called Petroleum Information which had been started and managed by Bill, Maury, George and Ed Goodin. Unfortunately in 2005, the Pinnacle Club declared bankruptcy and reorganized as the Denver Petroleum Club LLC and relocated to its present home at the Denver Athletic Club. Charles W. Goodin, son of Bill Goodin, led the reorganization effort, keeping the club alive. Click here for an editorial written by Bill Husted. 2007: The new Denver Petroleum Club started with 16 Founding Members on March 30, 2007, and grew to a membership of nearly 300 members in just a few short years. The Club’s mission to “facilitate economic growth of the oil and gas, and other energy industries through business, social and networking events” lives on. Today: Boasting more than 1,000 members, the DPC offers education, networking, and leadership development opportunities through a variety of programs and events. The DPC prides itself on providing a platform for members to build meaningful, prosperous relationships with their peers and increase their knowledge of the energy industry.